All you need is a touch of inspiration, a dash of motivation, and tons of dedication. Whether you are a fit for life kind of person or are just starting out on your journey, you have probably heard about sweet potatoes. But what makes the sweet potato so popular among the fit community? Why should we introduce it into our diet? Sweet potato is indigenous to Central America and made it into European diet after Christopher Columbus came back from his journey to the New World. There are over 400 hundred different varieties of Sweet Potatoes grown all over the world and the variety are largely dependent on the climate. 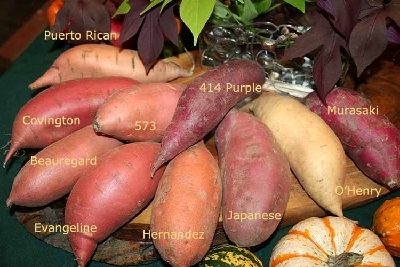 Climate, soil composition, and genetic makeup will influence the nutrient composition and color of the sweet potato variety. Sweet potatoes of all varieties are rich in Vitamin C, B6, and A, manganese, potassium, iron and fiber content. Apart from rich nutritional value, sweet potatoes can also help regulate blood sugar, decrease soft tissue inflammation, and according to some studies, contain significant antibacterial and anti-fungal properties. Different varieties of sweet potatoes are packed with antioxidant nutrients like beta-carotene and anthocyanin (cyanidins and peonidins). Orange colored sweet potatoes are full of carotenoid pigments which is what gives the sweet potato its distinctive orange color and sweetness. Some studies show that sweet potatoes are a better source of bioavailable beta-carotene than some green leafy vegetables such as kale, collards, and spinach. Beta- carotene is an antioxidant and a precursor to Vitamin A, also known as retinol. Retinol is a substance that is essential for maintaining retinal, skin, mucous membrane, teeth, and skeletal health. Purple-fleshed sweet potatoes are high in an antioxidant known as anthocyanin. This is also the compound that gives blueberries, grapes, purple cabbage and the Okinawan Sweet Potato its purple color. However, the concentration of anthocyanin is nearly 150% greater in the Okinawan Sweet Potato than it is in blueberries, the antioxidant powerhouse. Some studies show that a diet rich in cyanidins and peonidins can potentially lower the risk or mitigate the damage done by heavy metals and other oxidants in the digestive tract. When choosing sweet potatoes, make sure that they are firm and free of damage. Avoid those that are stored in the refrigerator section of the grocery store as lower temperatures negatively affect the taste. Keep your sweet potatoes out of the fridge and in a cool dark place. Usually, sweet potatoes can be stored for up to 10 days or longer. Boil, mash, and combine with walnuts, raisins, and a touch of agave syrup or honey. Shave thin using a mandolin, spray with olive oil, and season with salt or Cajun seasoning. Broil for -5-10 minutes to make Sweet Potato Chips. Boil, mash, season with herbs of your choice. Cut into fires, coat in coconut oil and bake at 350 F for 10 minutes. Sweet potatoes can be added to baked goods, desserts, and other dishes where a little bit of sweetness can go a long way. I have created this workout to be short and extremely efficient. With my schedule being the way it is in the last few weeks, I hardly had the time to spend on a workout. However, I don’t believe in making excuses and I am of the opinion that doing something is better than not doing anything. Enjoy and let me know what you think in the comments below or on our Facebook Page! We are all busy, at times stressed out, and occasionally extremely close to losing our minds. We tend to begin engaging in creative procrastination just to get ourselves some breathing room and eventually end up even more stressed because the to-do pile didn’t get any lighter. Then the guilt kicks in. Why didn’t I go to the gym yesterday instead of sitting on the couch watching TV? You know I could have made some baked chicken instead of eating Chinese. Why didn’t I do that? Oh man, I wish I wasn’t so tired so I can play tea party with my kids! The list goes on. So, what can we do to prevent guilt, remain sane, and stay a little bit more rested, fit and healthy? The answer is: learning to prioritize and, above all, learning to say “NO”. Getting our priorities straight is the first step to breaking free from the endless cycle of being behind. Personally, I am a list person. Every day I sit down and I make a list of things that need to be completed by the end of the next day. I make the same list for every week and for every month. It puts my schedule into perspective. I know exactly how much I can take on and when I can do it without cutting into something that is important to me or my family. The list also prevents me from forgetting to do the small things that end up turning into frustrations and inconveniences (like forgetting to get the dry-cleaning, or picking up some milk at the grocery store). That’s my way, and I know that this may not be the optimal way for everybody. Some may stress out over the list and the sheer amount of things that are on it, others may find it liberating to check things of and see how much was done at the end of the day. When I was talking to my friend about my prioritization strategy, she commented that she would be completely overwhelmed by the sheer idea of making lists everyday even if they weren’t written down. Her approach to setting priorities involved breaking her time into segments: Self, Family, Work, and Other. I know, some of you are looking at this and wondering what selfish person would put themselves before their family. I asked about that. My friend told me that the wellbeing of her family depends on her and if she is can’t be the “rock” for them, everything else will fall apart which is why she takes care of her health and mental wellbeing first. Regardless of how you choose to prioritize your life, until you do so, your stress levels will not diminish. Now, I am not saying that through prioritization you will completely get rid of stress. That’s just impossible. However you will significantly decrease the amount of it. It won’t be easy, you will have to choose between things and people who seem equally as important and tasks that seem equally urgent which brings me to my next point. No one likes to say “No” because no one likes to hear “No”. We, women, are especially guilty of that. We are the caretakers, we nurture and protect, we are the lionesses of our dens and god forbid someone tells us that we can’t do it all. But you know what, ladies? We can’t do it all and the sooner we understand that, the better of we will be. The first few times you put your foot down and unapologetically say no to something, it will be hard and you will feel guilty, but after a while of staying true to that practice you will notice two things: 1) you feel better about everything that you do because you are not stretched so thin 2) the things you do carry more meaning, the product of your labors is of a better quality which in turn makes you a happier person. I don’t know about you, but I’ll take the cycle described above over stressed, unhappy, and unhealthy. Now, knowing when to say “no” will largely depend on the priorities you set. 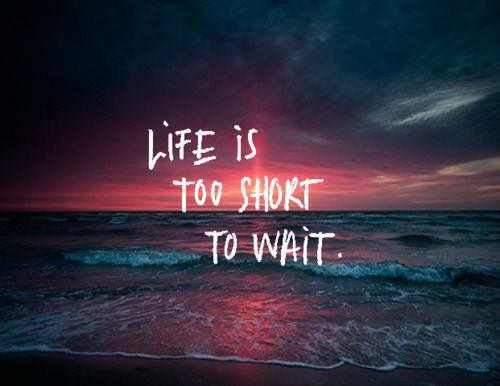 When you are absolutely sure about what is important in your life, saying “no” becomes easier. And like with any other art form, the longer you practice the art of “No”, the better at it you will become and the more liberated you will feel. I encourage everyone to take control of their lives and their stress levels because we are not the helpless victims of circumstance. We create our own realities and whether we choose to be miserable and exhausted or happy and motivated, the amount of work that goes into it is the same. Break the cycle, take control, and put your foot down in protest, stand tall and proud because you are strong and capable. The temperatures are beginning to drop and the cravings for comfort food are stronger and higher than ever. I am no stranger to the cold weather cravings phenomenon, however, I absolutely refuse to allow my body to freak out and gain weight right before the holidays. I am always looking for a healthy and delicious way to warm myself up after a cold, long run which is how this recipe was born. This is my version of a re-imagined Pho that will keep you on track with about half the fat and calories. I substituted the traditional noodles in this soup with Shirataki Tofu Noodle to cut back on carbs and raise protein percentages. However, I would like to caution you against using these noodles right out of the package. If they are not well rinsed prior to use, they tend to have an extra “tofuey” (yes, I made that word up, but I have no idea how to describe the off flavor of this noodle) flavor that could disrupt the delicate balance of flavors that you have crated. To rinse the noodles, drain the noodles, put them in a bowl or a strainer and run them through some cold water until the flavor is gone. I usually do it three times, that seems to do the trick for me, but you might want to do it a few more times depending on the brand of noodle you purchase. Anyway, enough with the rambling. Enjoy the recipe below, let me know how what you think in the comments below, and if you have any questions, you can always send me a message through our Facebook page. Combine Vegetable Broth and Pho Spice and Shitake Mushrooms in a medium – small sized pot and bring to a rolling boil. Decrease the heat and allow to simmer for 5 minutes. In the meantime thoroughly rinse your noodles and prepare your garnish. 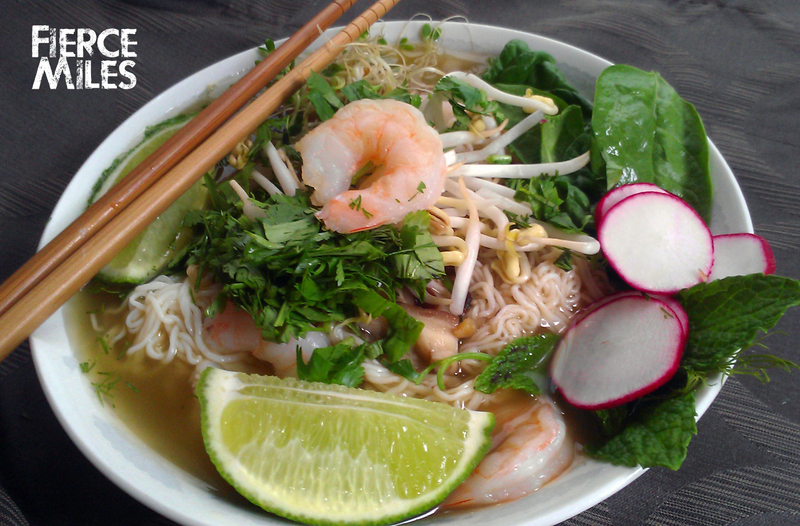 Arrange the noodles and shrimp on the bottom of a soup bowl, ladle hot broth over the noodles and the shrimp, garnish with radish, sprouts, cilantro, dill, spinach, and mint leaves. Squeeze a lime wedge over the soup and serve immediately. The weather has been getting cooler and I have been spending more and more time outside. If you are tired of the stuffy gym and are ready to enjoy this beautiful fall weather before the rains drive us back inside, here’s a short and sweet, calorie burning, cardio exhilarating treat that can be done anywhere! Remember, do what you can, take breaks when needed, and make sure that you are well hydrated before, during, and after exercise. If you are an animal lover and have a special affinity for beautiful Greyhouds, this event is for you. All the proceeds from this race go to the Southern Greyhound Adoption to help transport, vet, and upkeep retired Greyhound racers until they find their forever homes. For more information about this race visit Southern Greyhound Adoption website. Are you looking for a fun way to spend a Saturday? Come out and run this fun, family friendly, easy, and flat 5K. There will be lots of prizes, on course entertainment, incredible goodies, medals will be given to all finishers, and did I mention that you can drop your kids of for a fun, safe, and supervised play time while you run the race? The 5K takes place Required Fitness in Marietta. There will be plenty of parking. 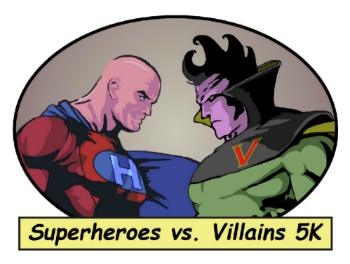 For more information visit Superheroes vs. Villains 5K website. 5th Annual Monster Dash is a race for a great cause. All the proceeds from this race will benefit Grant Park Cooperative Preschool (GPCP) in Atlanta. The race is conveniently located in Grant Park on the corner of Boulevard and Confederate. Arrive early as parking might be a challenge. All pre-registered participants will receive a t-shirt. Race day registration starts 7:30 am, the race starts at 8:30 am. There will also be a 5$ discount offered on race day to all college students with student ID. For more information visit 5th Annual Monster Dash website. 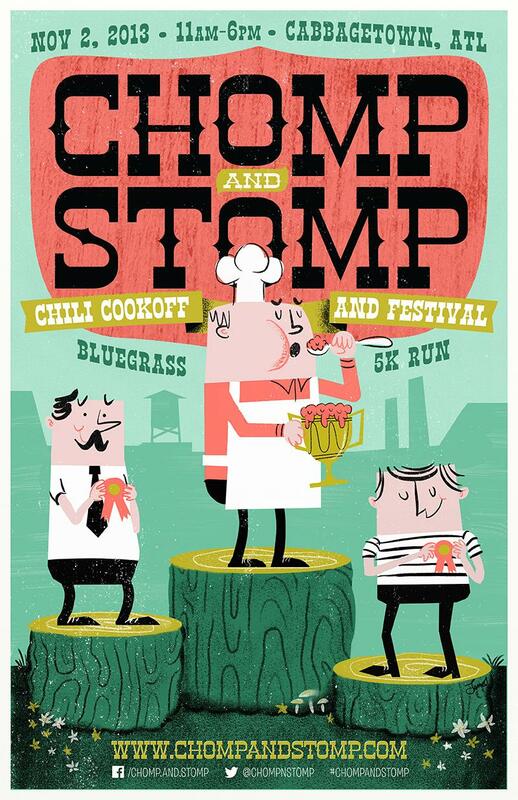 Chomp and Stomp is a wonderful festival and chili cook-off that starts with an easy, flat 5k. This is the 11th year of the festival that is thrown every year to benefit the historic Atlanta neighborhood of Cabbagetown. As part of the race package all of the participants will receive a free admission to the chili cook-off, and an awesome long sleeve shirt. Arrive early as parking is challenging in this part of the city. Register now as the race sells out pretty quickly! For more information about the festival and the race visits their website. This is a great way to preemptively burn off some calories this Thanksgiving. This event is conveniently located in at The Forum on Peachtree Pkwy with plenty of parking. A great, long sleeve, performance t-shirt will be given to all 5k finishers. Participants can pick up their registration packet at The Forum on November 27th from 2pm-6pm and on November 28th from 6:30am- 8:00am. Participants are encouraged to arrive at 7am on race day morning. The race will begin at 8 am sharp. This event is a rain or shine event, so come prepared. For more information visit Atlanta Turkey Day 5K website. This weeks workout features one of the underutilized, low impact exercise tools for improving work capacity and core strength — Battle Ropes. I often find myself using a variety of exercises using ropes as part of my cross-training and conditioning. There is an old Russian saying, “Hardships during training, make for easy battles”, meaning that your training should feel hard to alleviate the struggles during the times when you are actually judged based on your performance. The workout below is designed to simulate what a body goes through, physically and mentally, during a taxing race. 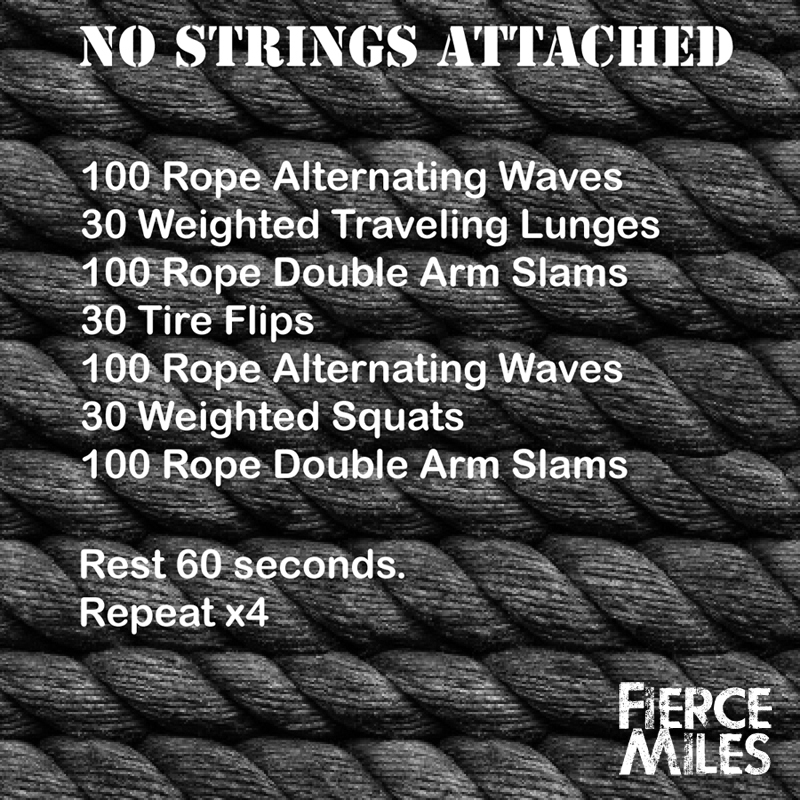 Let me know what you think of this workout on our Facebook page or in the comments below. 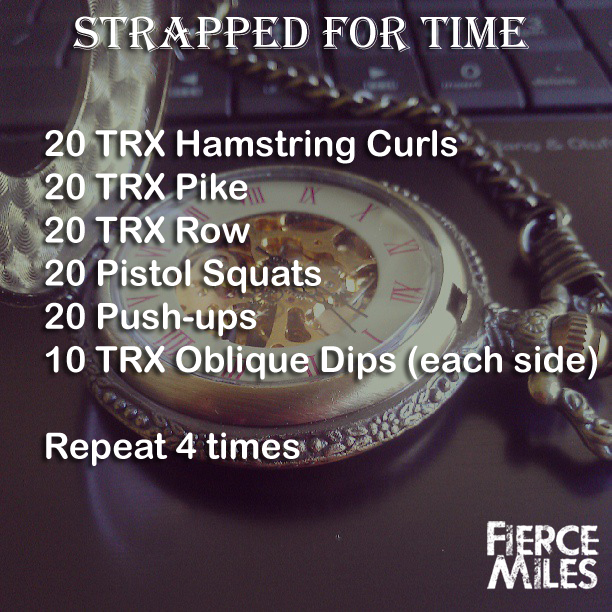 I recommend doing this workout without stopping until you get to the end of each set. However, as with any other exercise, you should exercise caution and take breaks when needed.